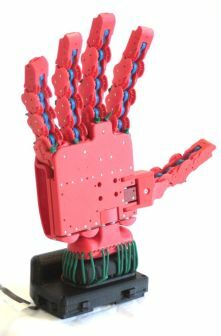 SoftHands will contribute toward a theory of hands capable of explaining the marvels of human hands, and of delivering new robot hands capable of getting closer to the performance of natural examples. Although many advances have been made in the mechatronics and computational hardware of artificial hands, the state of the art appears to be only marginally closer to a satisfactory functional approximation of the human hand than it was twenty years ago. The main reasons for this invest some fundamental issues in the understanding of the organization and control of hands, and ultimately the lack of a theory to guide us in the search for a principled approach to taming the complexity of hands. The project SoftHands contributes to the development of the fundamental elements of such a theory by means of two crucial, recent innovations. The first pillar is an approach to the description of the organization of the hand sensorimotor system in terms of geometric constraints, or synergies: correlations in redundant hand mobility (motor synergies), correlations in redundant cutaneous and kinaesthetic receptor readings (multi-cue integration), and overall sensorimotor control synergies. Elements of such theories have emerged recently in neurosciences, but their exploitation in the sciences of the artificial is an enormous potential barely touched upon till now. The second pillar is the understanding of the role of variable impedance actuation in embodying intelligent grasping and manipulation behaviours in humans, and the availability of a new generation of “robot muscles”, i.e. actuators capable of tuning their impedance to adapt to the environment and the task. The new Soft Hands embody as a system the most advanced perceptual, motor and control components, and will be integrated within a complete cognitive and physical architecture for artificial humans, in the form of a humanoid robot being developed at Istituto Italiano di Tecnologia - Department of Advanced Robotics, and inspired by similar principles in a coherent philosophy.